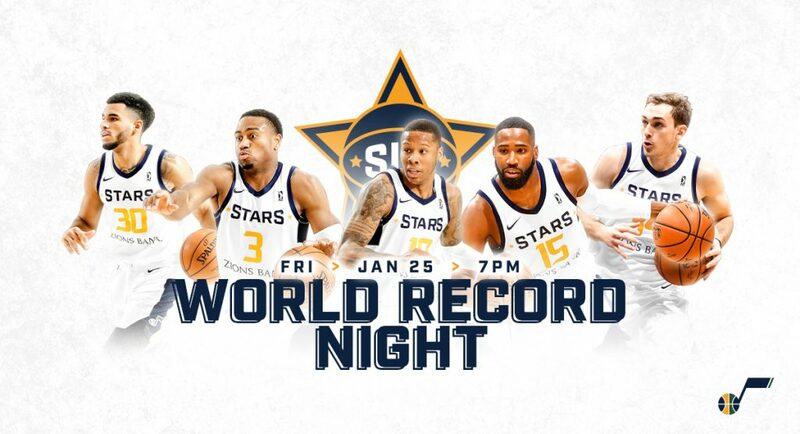 The Salt Lake City Stars, the NBA G League affiliate of the Utah Jazz, will host World Record Night on Friday, January 25 when the team faces the Long Island Nets. Doors to Bruin Arena on the campus of Salt Lake Community College in Taylorsville will open at 6 p.m. Tipoff is at 7 p.m.
Come make history as we attempt to beat world records throughout the game. The Kid’s Zone presented by University of Utah Health will be stocked with your favorite bounce houses! We’ll also have Buster the Bear in attendance making for a great night. Parking is free and doors open at 6 pm. At the conclusion of the game, select Stars players will participate in a postgame autograph session on the court.